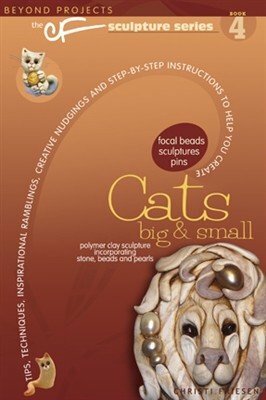 Christi Friesen Book 4 "Cats"
Home / Christi Friesen Book 4 "Cats"
This fourth book in the CF Sculpture Series is just full of feline fun. The big cats - lions and tigers and pumas, (oh my!) will roar to life as polymer clay focal beads, masks and sculptures. But not to be outdone, a parade of kitties will show who really rules. Throughout the book, embellishments of beads, fibers, and surface treatments will make this a book you want to cuddle up with.